Angles and calculating degrees are the founding concepts in geometry and trigonometry, but this knowledge is also useful in areas such as astronomy, architecture and engineering. Being able to find angle degrees is a necessary skill that you must master before delving into more advanced concepts, such as radians, arc length and sector area. Depending on the math level you’re at and the particular angle you’re dealing with, you can calculate angle degrees with a few different methods. 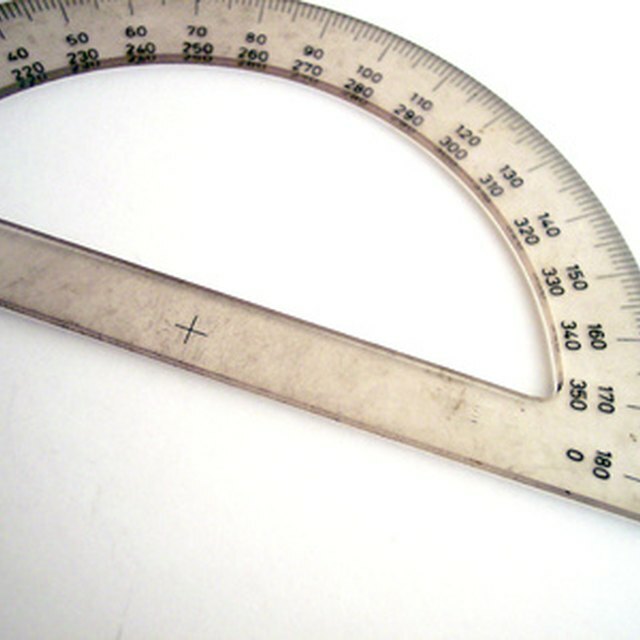 A protractor is to measuring angles what a ruler is to measuring length. It's a plastic or metal semi-circle with gradations at regular intervals from 0 to 90 degrees to the right and left of the 0 position. It's easy to use: Align the “0” gradation on the protractor with one of the rays of the angle and position the middle circle on the protractor on the vertex of the angle. Note where the other ray of the angle lines up on the protractor – this will give you the angle degrees. A triangle always has three angles, and they always add up to 180 degrees. Knowing this, you can always calculate the value of one of the angles if you know the values of the other two. Simply add those two values and subtract from 180. This doesn't help when you don't know the values of any of the angles, though. In such a case, the trigonometry of right-angled triangles can help. A right-angled triangle is one that contains an 90-degree angle. The other two angles therefore add up to 90 degrees, so if you can find one of them, you'll know the other. You can inscribe a right-angled triangle into any irregular triangle and determine one of the angles using sine and cosine charts. The value of either angle in a right-angle triangle can be determined by the lengths of the lines that form it, which you can measure. Dividing the length of the line opposite to the angle by the hypotenuse yields a fraction known as the "sine" of the angle, while dividing the length of the line adjacent the angle by the hypotenuse yields the "cosine." You can look up both of these fractions up in charts to find the angle. You have a triangle with three unknown angles. You draw a line perpendicular from one of the lines in the triangle to bisect one of the angles, thus forming a right-angled triangle. Once you measure the lengths of the lines, you'll have all you need to determine the values of all the angles. The angle you can determine most easily is the one that you didn't bisect. Suppose the length of the line you drew – the one opposite the angle – is 3 inches long, and the length of the hypotenuse of the right-angled triangle is 6 inches. The sine of the angle is therefore 3/6 = 0.5, and if you look that up in a chart, you'll find the angle to be 30 degrees. That means the other angle in the right-angle triangle is 60 degrees, because the two have to add up to 90. You bisected the angle in the original triangle when you drew the right-angled one, so the value of that angle is 120 degrees. That means the value of the third angle in the original triangle has to be 30 degrees, since the values of all the angles have to add up to 180. Revermann, Susan. "How to Calculate Angle Degrees." Sciencing, https://sciencing.com/calculate-angle-degrees-4963686.html. 13 March 2018. What Does Complementary Mean in Math?